I've noticed a few visitors to this blog have been searching for the term "Doka La" - which in Chinese has the same characters (Duokela Yakou 多克拉垭口)as the Doker La pass between NW Yunnan and Tibet (that I have written so much about as part of the Kawa Karpo Kora). I presume my new visitors are looking the more newsworthy Doka La, which is a strategic pass between India and Bhutan, near the disputed tri-border Doklam plateau area with Bhutan. This region is the site of the current military face-off between the PLA and the Indian Army over a road that the Chinese have built across disputed territory. I have taken a look on Google Earth, and with the help of this blog by "Rohitvats" I have tried to compile a map based on Google Earth 3D images. The Doka La seems to be the forward base for the Indian army on a pass that crosses into a corner of western Bhutan near the Chumbi valley. This valley extends into the Tibetan region of Yadong, which is a finger of China-administered territory jutting south into Bhutan. 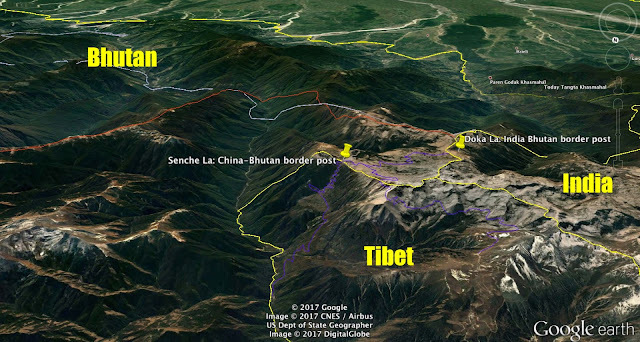 According to the current borders, the Tibetan-Bhutan border is at a place called Senche La. On Google earth you can see a zig zag road leading up to this pass from the Chumbi valley, from a large PLA barracks. However Google Earth also shows that someone - presumably the Chinese - has built a road across this remote sliver of plateau in Bhutan all the way to the India border post. 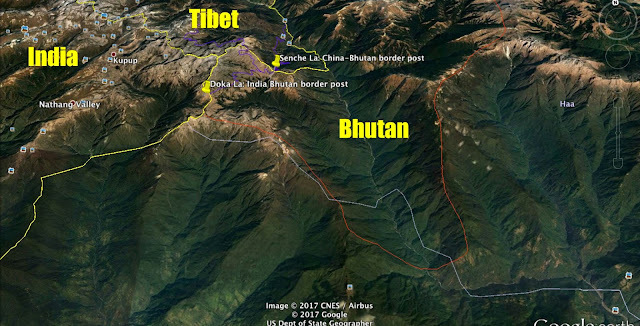 And China has recently published a new map showing what it claims to be the 'real' border between Bhutan and China - pushing he current border several km further south into Bhutan. Interestingly, the new Chinese map claims pretty much all of the remote Chumbi valley and all the high ridges above it. This makes plenty of sense from a military/strategic point of view, as it allows China to consolidate its position overlooking India and Bhutan, and securing its current precarious "chicken's neck" sliver of territory in the Chumbi valley. 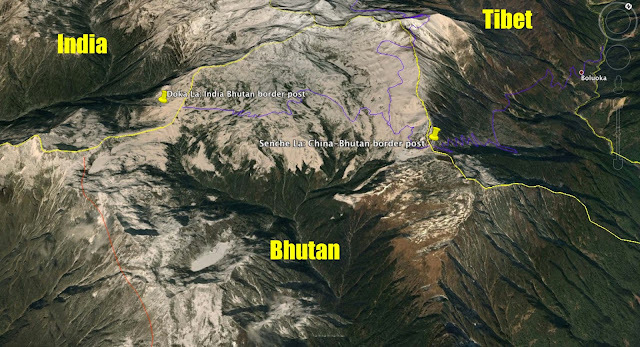 As you can see from the map, China currently controls only the west side of the valley, and thus the access road runs right along the border with Bhutan, which is literally a stone's throw away on the other side of the Cho river. And Bhutan's defence is managed by the Indian army. Not surprising that the PLA is seeking to secure its flanks in this highly sensitive area. In recent weeks the PLA have been very aggressively protesting Indian Army presence in what they claim is Chinese territory. This assertiveness has percolated through to the outside world, with overseas Chinese staging demonstrations over China's claims to the territory. Xinhua has even released a bizarre racist video that disparages Indians for their presence in the tri-border area. There some good historical background on the Nathu La trade route and the Yatung region here. Well, to make things a bit clearer, here are a few images of the 'other' Doka La. Current borders are marked in yellow, China's new border claim is in red, and the disputed Chinese built road through Bhutan is purple.